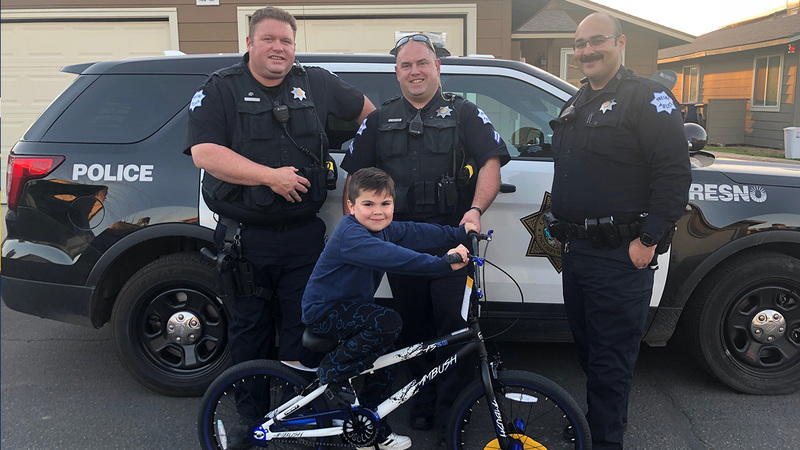 FRESNO, Calif. (KFSN) -- The heroic act of three Fresno police officers put a smile on a Fresno boy's face after they replaced his stolen bicycle. Police say 7-year-old Josiah was riding his bicycle in his apartment complex near Martin Luther King Boulevard and Annadale Avenue Saturday when two boys approached him and stole it. Josiah's mother called the police, and Corporal Daniel Messick, Officer Blake Dudley, and Officer Charles Martinez helped the two search the area, but were unable to locate the bicycle. After seeing that Josiah was upset, the officers pitched in to get Josiah a brand new bicycle. Police are still searching for Josiah's stolen bike. It has been described as a black and purple Kent Ambush bicycle. Those with information are asked to call the Fresno Police Department.